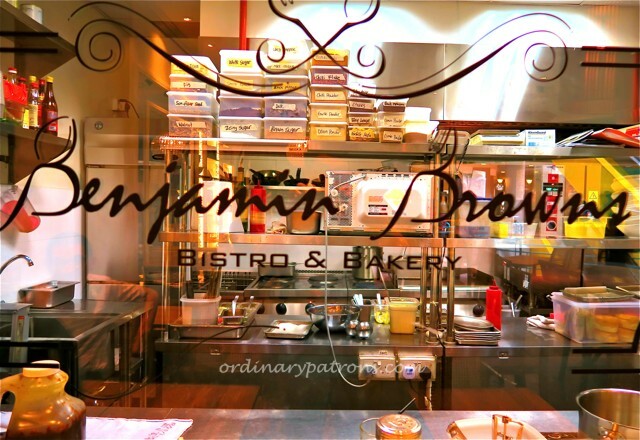 Benjamin Browns is an attractive cafe located on the first floor of the Forum along Singapore’s main shopping thoroughfare, Orchard Road. Its decor is cozy and inviting so we could not resist popping in for a coffee. The cake display was colourful and interesting, especially the animal cupcakes which will surely attract the attention of the many children at this mall which specializes in stores for the young. We decided to try a slice of the more sombre looking chocolate cake ($8). The cappuccino was excellent – very fragrant, rich and full bodied. You are better-off for coffee here than any of the usual well known coffee chains in terms of both taste and value. The cake was however a bit too sweet for us. Perhaps it was also tuned to suit the taste of the younger patrons. The savoury food menu looks interesting and that would probably be a better bet at our next visit. This is a pleasant place to re-charge if you are busy shopping in the area or have just dropped off your kids at one of the many educational centres in the mall.